This is a basic "survival guide" to PAT testing, safety testing of electrical equipment in the UK. (Plugs and safety testing will vary greatly in other countries and regions.) This guide concentrates on the topics which are important for a Restart event, and does not cover topics which are more relevant for periodic inspection and testing in a workplace or other situations. Portable Appliance Testing (PAT) is used to identify electrical faults in mains appliances which can make the appliance unsafe to connect to the mains or to use. In the context of a Restart event, mains operated appliances must be tested both before and after any attempted repair. There will be faulty, and often unsafe, mains appliances at Restart events. Occasionally the visitor will say they are unsafe, but mostly the visitor won't know. It is essential to protect everyone at the event from hazards due to unsafe appliances. It is essential to protect the visitor and anyone else who uses the appliance after it is taken away, OR ensure the visitor knows that the appliance is not safe if it couldn't be repaired. A Visual Inspection. This is the most important part and must be done first as it reveals the majority of faults. As part of this, you must identify the Class of the appliance, which is a prerequisite to performing the second part. An Automated Test using a PAT tester. This should not be performed until any faults identified in the visual inspection are fixed. It's essential to understand that the automated test requires that you correctly identified the Class of equipment, since if you get this wrong you could pass a faulty appliance with potentially dangerous consequences. A test is required before any repair, so that the owner and teacher know the initial condition. This might reveal the item is not be safe to plug in, presenting a danger to owner, teacher, and others at the event. Such faults could also cause the electricity supply at the event to be tripped out, inconveniencing others, particularly if there is no access to get the power switched back on. The teacher should ensure the fault causing the the PAT failure is fixed before attempting to fix any other fault in the appliance. A test is also required after any repair or opening up of the appliance. This is to ensure the appliance is safe to use afterwards, and that the repair has not caused a fault. If an appliance is not safe to use (e.g. 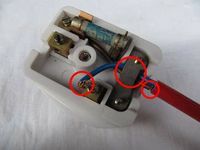 the PAT fault was not repaired), the owner should not take it away in a usable state—the mains plug should be removed or at a minimum the fuse removed, so the owner cannot connect the appliance to the mains. As previously stated, it is essential to correctly identify the Class of an appliance otherwise a faulty appliance could be passed as OK with potentially dangerous consequences. Do not touch metal parts of an appliance during testing. Though unlikely, it is theoretically possible that you could get an electric shock if the appliance is faulty or the earth lead is not attached securely. All mains powered appliances should be PAT tested both before and after a repair is attempted. A faulty appliance must have its mains plug removed and the owner must be informed that it is unsafe unless the fault can be immediately rectified (e.g. by replacing a cracked mains plug). Statistics show that 90% of faults are detected by visual inspections, which will reveal faults that an automated electrical test cannot detect. Therefore, a visual inspection must never be skipped. The only tool you need is a screwdriver. 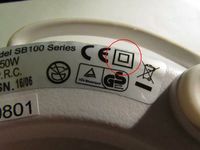 Check the plug is marked as conforming to BS 1361. Check for a cracked or broken plug, bent or loose pins, or any signs of overheating. In these cases, the plug will need to be replaced before the appliance can be declared safe. The plug must be a fused type if it has a mains lead is attached. Check that a suitably rated fuse is fitted to protect the mains lead. Check the fuse is marked with the ASTA certification diamond, and is marked as conforming to BS 1362. Very old fuses without both these markings might fail to protect the cable or overheat in the plug, and should be replaced. Also check there is no sign of overheating and that the fuse clips hold it tightly—this is particularly important with high power appliances. Modern plugs have the live and neutral pins insulated for half their length. 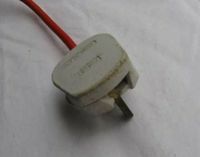 It is not a PAT test failure to find an older plug without insulated pins, but the owner should be advised that it is illegal to sell an appliance with a plug which doesn't have modern insulated pins, even at a car boot sale or fair. If the plug is rewireable (i.e. not a molded plug), open it and check that it's correctly wired, and the screw terminals are tight with no stray strands of conductor. Check that the cable clamp in the plug is firmly gripping the cable outer sheath and allowing no movement. If the plug is molded to the lead, check the lead has not become loose where it enters the plug. Check for deformed cable where it's been overly flexed, typically near the ends, particularly with appliances often moved around such as irons. Check for fraying of the mains lead, or cracking or cuts into the insulation, or any such deterioration which has simply been taped over. In the event of any cracking of the inner insulation exposing the copper conductors, the owner should be advised that the appliance is positively dangerous, and must not be used until the mains lead has been replaced as it is likely to constitute a fire or electric shock hazard. If there are any joins in the lead, these must be done with proper cable couplers incorporating cord grips. Taped or chocolate box connections are not acceptable. You may want to open and check any such couplers in a similar way to checking mains plugs. If the coupler forms a plug and socket, it must have the same number of pins as the lead has conductors, so that all conductors are connected through and there are no unused pins (i.e. a 2-pin plug and socket mustn't be used on a 3-core lead, and a 3-pin plug and socket mustn't be used on a 2-core lead). Check that the cable clamp is firmly gripping the cable outer sheath and allowing no movement. Check the appliance casing is not damaged to the extent that it is electrically or mechanically unsafe. Check all appliance safety interlocks work. (There are often several on things like kitchen blenders.) It is never permitted to bypass any safety interlock as a means to make an appliance work. Check the mechanical operation of all switches, as far as is possible without the appliance plugged in. Before you can perform the Automated Tests, it's necessary to understand the different Classes of appliance, otherwise these tests cannot be performed reliably. But as you'll see, you only need to worry about Class 1 and Class 2. The mains lead of a Class 1 appliance has 3 wires. In addition to the Live and Neutral (which carry the electric current to the appliance, and return it to the mains outlet), there is an Earth wire, connected to the metal frame. In the event of a fault, this provides a much easier return path for the current than through your body, so greatly reducing the risk of electric shock. The Neutral is blue - a pretty neutral and benign colour. Note that a Class 1 appliance may or may not have any exposed metal parts, but internally will normally have a metal frame. This has exposed metal parts which are connected to the earth wire. Internal metal parts such as a frame or a motor casing are connected to earth, but the outer casing is plastic (although it might have some isolated metalwork on it such as a rating plate or decorations). Class 2 appliances just have 2 wires. (That's pretty easy to remember, isn't it?) These are the Live and Neutral. Class 2 appliances have no exposed metal parts which could possibly become live and create an electric shock hazard in the event of a fault. Nevertheless, they may still have exposed metal parts which are doubly insulated from the mains supply. Class 3 appliances are extra low voltage devices running off batteries or a separate mains power supply (which itself might be Class 1 or Class 2). Since extra low voltages don't constitute an electric shock hazard, no testing is required. "Double Insulated" symbol. Notice also the clearly oval cross section mains lead. To determine whether an appliance is Class 1 or Class 2, run down the following checklist until you have the answer. Does the appliance have a double-square "Double-Insulated" sign? If so, it's Class 2. If it has a detachable mains lead, how many holes does the appliance end of the lead have (or how many pins does the socket on the appliance have)? If 2, it's Class 2, or if 3, it's Class 1. Remove the lid from the mains plug if you can. How many wires are there connected in the plug? If only 2 (brown and blue) then it's Class 2, but if 3 (brown, blue and green/yellow) then it's Class 1. If you can remove the cover from the appliance, try and see how many wires emerge into it from the mains lead. If only 2, it's Class 2, but if 3, then it's Class 1. Does the appliance have a metal case? Then it's probably Class 1, unless it's audio/visual equipment which may be Class 1 or Class 2. Visual Inspection also applies to extension leads, with the same checks. The cable should be inspected for overheating, which is frequently caused by using an extension lead while coiled up. The sockets require careful inspection for any overheating and any sockets which don't grip plugs well. Test the plug in each socket for a good fit. Sockets on extension leads are usually significantly inferior quality and life when compared with fixed sockets. Leads up to 12m long must have conductors at least 1.25mm² cross sectional area. Leads up to 15m long must have conductors at least 1.5mm² cross sectional area. Leads up to 25m long must have conductors at least 2.5mm² cross sectional area (these won't fit in most 13A plugs). Longer leads require a proportionally lower value plug fuse. For example, a 20m 1.25mm² lead requires a 12÷20×13 = 7.8A fuse (nearest value rounding down is 7A, or the more easily available 5A). It is bad practice to daisy-chain extension leads, and they must never be daisy-chained beyond the lengths above. The reason for these limits is the increasing resistance of the lead with increased length will reduce the current flowing in the case of a short circuit, and this will cause the fuse to blow too slowly (or even not at all), thereby not protecting adequately against electric shock, and allowing enough energy to be generated to damage the cable and start a fire. The Restart Project has a BattPAT automatic PAT tester. Here is the manual and a video showing how to use it. This is summarised below. The same instructions should be broadly applicable to other basic models of PAT tester, though computerised testers designed for production use and automatic test result recording may be more complicated. Plug the appliance into the PAT tester. Clip the earth lead onto a metal part of the appliance. Press the Class 1 Metal button. Check that no Fail indicators light up. Leave the earth lead to one side. Press the Class 1 Plastic button. If the appliance has any exposed metal parts, clip the earth lead onto one of them. Press the Class 2 button. Never try to determine what Class an appliance is by seeing which test passes. If a test fails and you're not certain that you've selected the right Class, always ask someone more experienced for assistance. Press the Power Cord button. Plug the mains extension lead into the tester. Plug an IEC lead which came with the tester, or a known good one, into the mains extension lead. Note that the socket grips well - extension lead sockets do wear out quickly in many cases. Plug the other end of the IEC lead into the tester. If the extension lead is over 10m in length but less than 25m, press the Long Lead button. If the extension lead is over 25m in length but less than 40m, press the Long Lead button a second time. If the extension lead has more than one socket, repeat with each of the remaining sockets in turn. YouTube Video giving simple demonstrations of PAT testing of various appliances. YouTube Video explaining the Automated Test in detail. This page was last edited on 27 August 2018, at 16:33.